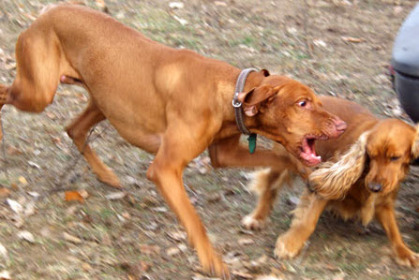 Dog aggression is not a natural state of mind for a dog, so it is a correctable behavior. This is another issue we love working through because dogs are so much happier once they are free from this burden. The first thing we need to do in solving your dog’s aggression problem is change his state of mind and the way he not only perceives but chooses to respond to stressors or triggers that result in the aggressive behavior. There are several types of aggressive behavior (see chart below), and most aggression can be eliminated. Some aggressive behavior, such as “predatory aggression” you cannot “solve” because it is directly related to instincts, but you can be very successful managing it by showing your dog when it is and isn’t appropriate to use their prey drive. The most common types of aggressive dog behavior that we work through are Fear Aggression, Predatory Aggression, Dog Aggression, and Human Aggression. A lot of times aggression is misdiagnosed, or someone has put inappropriate label on it like, “my dog hates other dogs” or “my dog hates people with hats on”. Dogs can’t “hate” or at least that is not why they react. Reasons a dog might react could be possessiveness, fearful, territorial, and some dogs even have a false sense of entitlement. 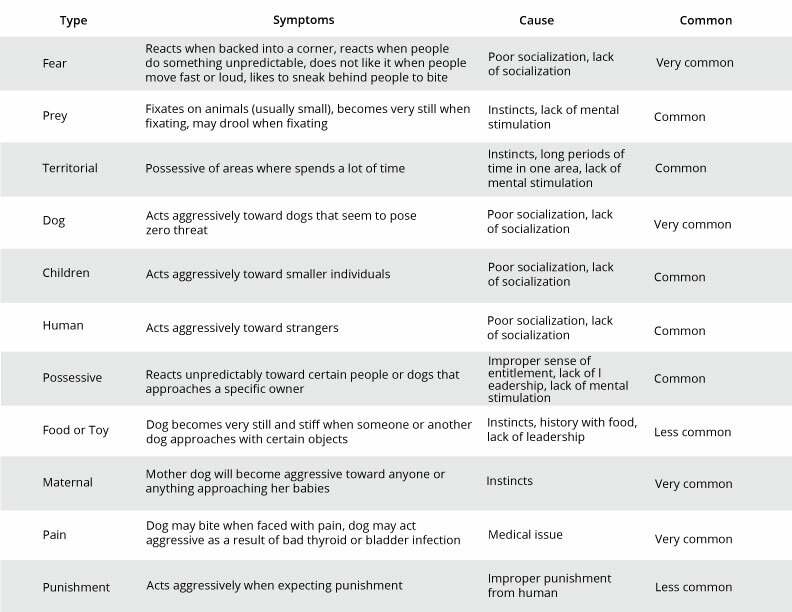 All of these are symptoms of the underlying problems, lack of an advocate to help guide them to the right decisions, lack of mental exercise creating a stressful, crazy frame of mind, lack of leadership in the dog’s life, to name a few. This forces the pup to make decisions on his own, which honestly VERY few dogs are good at doing, they would much rather have a leader and a guide until they are comfortable making these decisions on their own. Many aggressive dog owners don’t realize that social skills are something most dogs need to continue practicing throughout their life. You really can never stop socializing you dog in order to keep their skills fully fresh. We hear a lot of owners say their dog used to get along great with other dogs, and for some reason they hate other dogs now, this is usually a case of a dog whose social skills have not stayed “current” or “fresh”. For some dogs, social skills have to be practiced very frequently in order to be good with other dogs. Keep in mind too, social skills are required to communicate with “strange” dogs, not dogs they know or see all the time. If you are getting your dog around the same dogs all the time, that is not practicing social skills.